These are items that the player can fill out themselves and may have bearing on in-game and text based roleplaying. These include any feature or item that might in some way be connected or related to information taken from the Game CP. Consider them speculative for now. Access to private messages from other players, groups, admins and faction NPC leaders. Bounties currently on this player. Bounties offered by this player for another’s destruction. I'd appreciate any questions, comments and ideas from the community! Can't guarantee everything (or anything) will make the eventual cut, but we're better off going in with a fully formed idea. Access to GNN and faction run news services? Since it's already in game being able to view flight time would be nice. Would probably be more representative than the kill count to be honest though not by much. 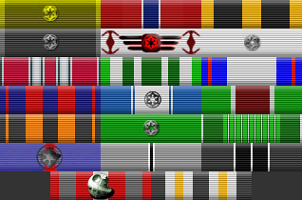 Under profile perhaps provide an interface to allow leaders to change ranks and medals. Financing and loans. Financing through a bank is typically available with a down payment of 20% the ship's cost, monthly payments vary by bank. Less appealing but more interesting is taking from a loan shark. This is typically done with a down payment of only 10% the ship's cost but interest is so high that missed payments may result in the loan never being repayable. If you don't pay off a loan shark he'll send bounty hunters after you. Used starships. Allow players to sell their ships (in whatever condition they're in) to other players. Kills aren't representative of a player's skill unless you can narrow it down by showing the number of kills they have on players and NPCs separately. Even then it's hard to tell whether the person had assistance or if the player has just been nuking noobs in TIE Fighters or Y-Wings. 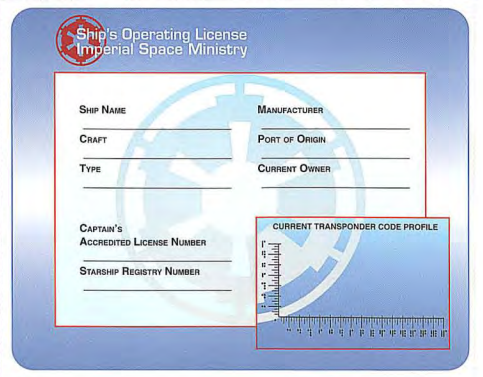 Certifies captain is capable of operating and piloting the starship. Would use for bulkers and large "multi-crew" craft. Average cost 200 (500 if inexperienced). Track's ship make, manufacturer, port of origin, transponder codes, and owner. Require's a captain's accredited license and inspection (all systems functioning, no missing escape pods, no illegal modifications, functioning transponder code). Average cost 1,000. 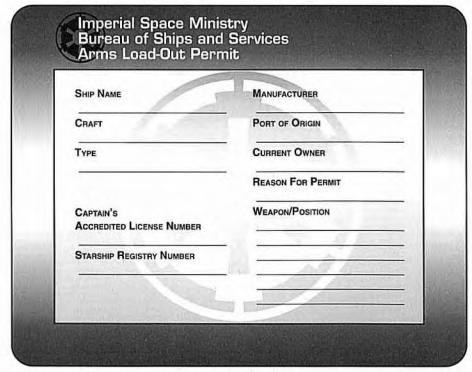 Registers ship's weapons. Cost based on weapon availability. I suggest some functionality for offering, taking, and paying out contracts for things other than bounties.